I have told this story many times in print and on the air. Now it is even more important to repeat it. In the spring of 1966, my junior year at Yale College, a classmate of mine who would be called gay today, but back then much worse words were used, walked past a group of us sitting in the Davenport College common room after dinner, shooting the breeze. Someone in the group, now looking back, someone who was a bigot, chuckled and loudly whispered – loud enough for the individual walking past us to hear – the “F” word. I cringed — but said nothing. I cursed myself for not having the courage to speak up at that moment with words like these. I turned to see who it was who did. 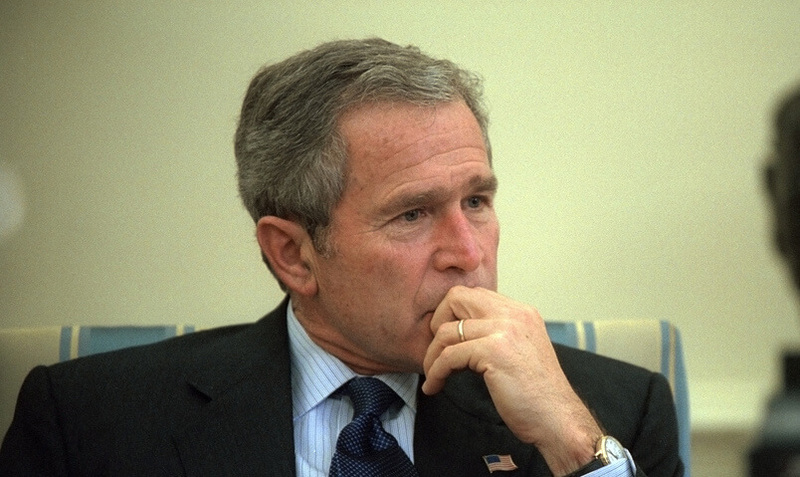 It was George W. Bush, a year behind me as a sophomore, a fellow resident of Davenport and my fraternity brother at the social non-residential fraternity of Delta Kappa Epsilon (DKE). I knew George casually then – mostly from playing pool and partying at DKE. Also, as a pretty good pitcher on the Yale baseball team. He was liked by virtually everyone. As soon as we heard his words, most of us turned to him, startled. Who was this George Bush? It was as if we hadn’t known him before now. And most of us, like me, decided then: We need to know this guy better. He had taught us an important lesson – silence is not an option in the face of indecency, cruelty, bigotry, bullying towards others. I thought about that moment 34 years later when George W. Bush was elected America’s 43rd president. And many times since then. I didn’t vote for him in 2000 or 2004. I’m a liberal, he’s a conservative. But I always admired him most of all because of his core value that I saw that day at Yale – the Decency Value. It’s in his family DNA — his dad, the 41stpresident, and his grand-father, Prescott Bush, who served nobly in the U.S. Senate representing Connecticut in the 1950s as a moderate Republican who had the courage to stand up to Sen. Joseph McCarthy (R-Wis.). “Bigotry seems emboldened” [by Trump]. “Our politics seems more vulnerable to conspiracy theories and outright fabrication” [by Trump]. “We’ve seen our discourse degraded by casual cruelty” [by Trump]. “Argument turns too easily into animosity” [by Trump]. It is time for all Americans – liberals and conservatives, Democrats and Republicans, pro-Trump voters and pro-Clinton voters – to speak up; time especially for congressional Republicans to follow the example of Tennessee Republican Sen. Bob Corker, who challenged Mr. Trump for unstable behavior, divisive Tweets, and reckless words that could bring the world to the brink of nuclear war. It’s time for all of us, including our heroic Four Star Generals, who believe that the Decency Value is what truly makes America great – it’s time to say to President Trump: Enough. Davis, a weekly columnist for The Hill newspaper, is co-founder of both the Washington law firm Davis Goldberg Galper PLLC and Trident DMG, a strategic media firm specializing in crisis management. He served as special counsel to President Clinton in 1996-98 and a member of President Bush’s Privacy and Civil Liberties Oversight Board, created on the recommendation of the “9/11 Commission.” Davis has been on a leave of absence from his weekly “Purple Nation” column for the last eight months while completing a book on the 2016 presidential campaign, due to be published early next year. NEXT POST Next post: Could Iowan Sam Clovis’ Actions Take Down Donald Trump? “He was raising his voice against indecent words and conduct towards others. ” Too bad he was out of the loop on torture. He surely would have spoken up against that, and the atrocities of the Iraq invasion, too. Uh, that’s a big NO, what a bunch of rubbish. There’s more to decency than how one talks and what one says. Isn’t W responsible for destabilizing the entire Middle East with his pre-emptive war of choice policy? According to the “Lancet” our war in Iraq caused the deaths of over 100,000 people…not to mention the deaths, loss of limbs and PTSD of our troops. What about the blacksites where people were abducted and taken to be tortured as well as Guantanamo…all for a LIE. They knew that Iraq had no “weapons of mass destruction” and this LIE was the beginning of our recent loss of credibility in the world. HE is one of the reasons we have Trump as if you remember during the debates he rubbed Jeb’s nose in his brother’s poor decision making and failures. What about the devastation he wrought on our country? Purposely ignoring Clinton’s warning about the pending 911 attack? Tax cuts not paid for and the war being left off the books? His failed cross country tour to privatize Social Security? No, sorry no rehabilitation of Bush for me thanks.